The movement against the war on Iraq was larger and more exciting than other recent anti-war movements. This article focuses on the organization and character of the movement in the UK, and describes how some of the dynamics of the movement as a whole were played out in one UK city, where we were involved. We argue that the feeling that what happened was challenging lay not so much in the nature of the actions, but rather in the number and variety of people brought into the movement and in the failure of the liberal peace movement to exercise the usual control. 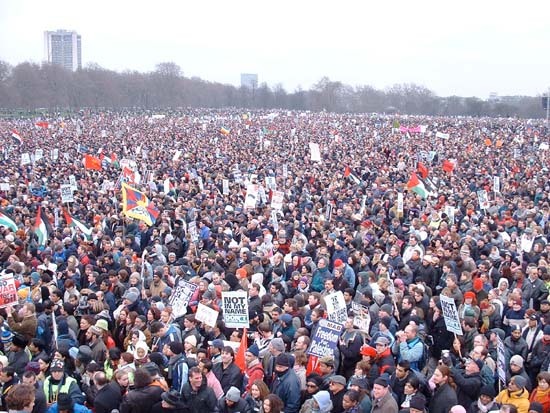 The demonstration on February 15th 2002 against the threatened war on Iraq was the biggest protest march in British history. Almost unique in recent history, it was promoted beforehand by sections of the UK national media. The following day, the newspaper front pages were dominated by pictures of all the thousands in the streets, such images being treated as far more eloquent than the accompanying hacks' commentary. What are we to make of this phenomenon? On the one hand, it seemed to be an expression of a movement with a lot of potential and energy - as witnessed in the many actions which disrupted daily life in various towns and cities around the world in the period leading up to and including the day war on Iraq was officially declared. On the other hand, the obvious involvement of sections of the ruling class in promoting the national demonstration, the traditional form of many of the protests, and their predominantly humanist (rather than class) rationale could lead us to conclude that all this energy was ultimately going up a blind alley. One particular question that arises is that of why (so many) people got involved in the protest in comparison to the movements against the war in Iraq (1991), Kosovo and in Afghanistan. Given what happened (or rather what didn't happen) in response to these previous wars, the scale of the recent movement took many of us by surprise. Even in the USA, where the attacks of September 11th had seemed to close down the space for displays of opposition, there were demos across the country (and even by government scientists at a US base on the South Pole). In San Francisco, the city was virtually brought to a halt for two days when the war started; and in New York, despite a ban and a fairly heavy police attempts to enforce a ban, 200,000 took to the streets. As elsewhere, the UK national demonstrations, while of the plodding variety, were phenomenally large. The recent protests not only had a political impact, they also appeared to affect the subjectivity of many of those who took part in them. Many for the first time became interested in 'politics', and demanded to know more and to understand the wider world. This politicization seems to have been developing before the demonstrations themselves and was reflected in a general thirst for information. This desire to grasp what was happening would appear to be one of a number of differences between reactions to this Gulf War and that in 1991. While in 1991, there were objections to the way the war was presented in the media - i.e. as akin to a video game - bourgeois journalists remained relatively uncritical of the justifications for the war itself. This time round, however, the size of the movement of opposition to the war, and the fact that the world bourgeoisie was not united behind it, encouraged a much more critical tone in much of the media. The lack of a decisive conclusion to the war, with no arsenal of 'weapons of mass destruction' (WMD) being found, and the quick victory turning into a bloody messy occupation, has led to a questioning of the motives behind and reasoning for the war. This questioning has continued, even if in part the government has managed to deal with the situation with an overload of tedious information around side issues like its argument with the BBC over its dossier on Iraq's WMD and the death of the weapons expert Dr David Kelly that resulted from it. The contrast with reactions to the Kosovo war is starker. On that occasion, the 'humanitarian' gloss on the war served to wrong-foot the liberals in the peace movement as well as others who might have got involved, such as the direct activists. Even the traditional left could not decide whether they should defend Serbia against imperialist NATO or the oppressed Kosovars against 'fascist' Serbia. With the recent Gulf War, however, the pretext for war was so painfully thin that most liberals and leftists could easily reject it. The recent movement in the UK has a continuity with the movement against the bombing of Afghanistan in 2001,when there was again a network of local groups and a series of national demonstrations, which became smaller and more resigned over time as the activists eventually dropped out. In effect, the movement collapsed, having built up nothing like the momentum of the most recent movement. This article seeks to address this question of how and why this anti-war movement was different. The movement was a worldwide phenomenon, and many of the features discussed here occurred in countries around the world. The present article is not a comprehensive overview but focuses simply on the organization and character of the movement in the UK, however, because that is where we, as the writers of this article, were involved. In particular, we describe how some of the dynamics of the movement as a whole were played out in one UK town, where most of us were involved. We conclude with some thoughts on the potential and limits of the movement. As we discuss elsewhere in this issue, the attack on Iraq needs to be understood as part of an attempt by sections of the (US) bourgeoisie to use its military superiority pro-actively to reorder the strategically and economically vital area of the Middle East in its interests and to demonstrate to the rest of the world that it could do this. The struggle against the war therefore seemed necessary in order to defend the lives of the human beings - most of course fellow proletarians - who would lose out to the potentially unending series of pre-emptive conflicts that the USA was preparing for. However, for us, the key reason for opposition to the war was not some kind of liberal humanitarianism, but proletarian self-interest. A failure for this war to produce opposition would have a very negative impact on the subsequent development of the class struggle - in particular in the US and UK. The kind of attacks that took place on US longshoremen (dockers) during the war would only increase and be generalized in the absence of any kind of collective opposition to the war. Yet the question of involvement has appeared as a dilemma for some of us. While opposition was necessary, the movement was clearly not going to express itself in class terms, and as such opportunities for effective action would be resisted. For example, no practical links were made with the UK fire-fighters' dispute. The best that could be hoped for, perhaps, was a more militant movement rather than a radical one. Thus, as has been the usual situation in response to capitalist war since 1990, some ultra-left and anarchist types have argued that we should not get involved in the movement, since such involvement would mean support for the left-wing (and even the liberal wing) of capital. And some direct activists didn't want to get involved in what they saw as no more than a liberal- and Socialist Workers Party (SWP)-dominated pacifist popular front. But this (ultra-left) critique of participation in the anti-war movement while essentially correct is also one-sided. Our instinctive reaction to arguments that we go to the march but not be 'on' the march is that they display a 'purism' whereby the political subject takes refusing to march behind the banners of the left as a positive step. For us, when it comes down to it, it makes little difference whether you go on the march or not. Like those who stand on the sidelines, we largely go on such demos out of a desire to get a feel of the mood of where people are at. Whether you do that by going on the march or by standing by the sides makes little difference. However, when it comes to local activity, we feel able to get involved in movements even if they are contradictory, since we may have an impact. Moreover, for us, involvement in this movement was not only an imperative, but also an opportunity. The involvement of sections of the ruling class in the building-up of the national anti-war demonstrations was an indication not of an organized plot to divert proletarian energy, but rather a manifestation of disarray and a reduced ability to mobilize their forces on the part of the bourgeoisie, that has served to create a possible space for other needs to be expressed. Sections of the ruling class were taken back by the scale of the opposition, and the willingness of so many people to be on the streets. This was most evident in the fact of the Prime Minister, Tony Blair, publicly acknowledging the size of the February demo even before it happened. Whereas the government normally ignore demonstrations unless there is a riot, this time the prime minister tried to get in a pre-emptive strike by anticipating the numbers and suggesting that it would still be a minority. Anti-war elements of the ruling class became further encouraged by the obvious strength of popular feeling. The result was that the government was split and on the verge of crisis, and reluctantly agreed to a parliamentary vote on the war. While such a procedure was of course a way of politically managing the potential crisis, it was a procedure forced upon the government in order to keep the movement within democratic bounds. On the one hand this public disagreement merely reflects that function of democracy which is to contain and accommodate conflict and thereby legitimize capitalist relations in which 'everyone has a voice'. However, there was at least some potential that the 'democratic disagreements' over the war might escalate into something more. Muslims on the marches who in Britain are a group overwhelmingly at the bottom of the wage hierarchy, was largely organized through the mosques dominated by the middle class and petit bourgeoisie. Further, while those at the universities were struck by the level of activity around the war (and to a lesser extent this also occurred in 'white collar' workplaces like the local councils), in the post office - still a site of traditional working class militancy - one of our friends was not aware of even one of his work-mates going on the national demonstrations. What explains the level of white collar and middle class involvement in the anti-war movement? An answer to this question lies perhaps in the nature of 'New Labour' Project, the thrust of which was to build an electoral coalition for New Labour around the 'middle classes' - not only professionals, the petit bourgeoisie etc., but also those who orient to and think of themselves as middle class, such as those who have mortgages and private pensions etc. They supported New Labour because it promised no tax rises and to continue to support (but also to 'modernize') the National Health Service; they were the kind of people who could not necessarily afford a private health plan, but wanted and expected more 'customer choice' in the provision of such services. While the New Labour Project has involved courting such people, many of them - particularly those within jobs in and around the local and national state - have suffered from the failure of the New Labour Project to meet their expectations. The threat of restructuring and insecurity to white collar jobs (e.g. in education, local government and health), the various public sector targets, and the removal of occupational pensions have together served to create a climate of anxiety, uncertainty and unease amongst people who might have expected the government to look after their interests rather better. Thus many of those participating in the national demonstrations were students and ex-students, clerical staff, local government employees and so on: the would-be middle class who are in fact now the new working class. They did so because the war has served to unite 'everyone' against the government - to displace myriad individual problems onto a clear collective target: the government and its overall project. Socialist Workers Party (SWP), but also included representatives from other leftist groups and Muslim organizations. Campaign for Nuclear Disarmament (CND) pacifists stepped back from the Coalition relatively early on. The SWP sought to steer the coalition towards building a 'the largest movement possible', which meant around the lowest common denominator politically, at the same time embracing Muslim organizations and the Free Palestine campaign (which dove-tailed anyway with SWP's anti-imperialism). In terms of numbers, it can be said to have succeeded. StWC 'national meetings' were rallies rather than debates. Motions were token. The first meeting (due to take place before Xmas 2002) was cancelled anyway because of the fire-fighters' strike. But most people attending the meetings, although they complained, in effect went along with the stitch-ups; there was little in way of initiatives for alternatives. The fact that, without Coalition support - and indeed despite Coalition attempts to undermine them - protests at Fairford Airbase in Gloucestershire became a potential alternative focus for the protests shows that other organizational forces carried at least some weight. The Fairford protests remained a potential rather than an actual locus of national organization, however. The CND-types in the Bristol group who called the Fairford protests were overwhelmingly localist in outlook. For example, they supported the call for a demo at Menwith Hill, Yorkshire, on the same day as one of the Fairford protests! There was in other words no proper attempt to develop an alternative national focus - even though Fairford organizers were hostile to the StWC. Some of the dynamics described above can be illustrated through the experience in one town, although it should be conceded that what happened here may not have been typical. This account at least conveys some of the excitement and issues that confronted some of us, and we hope it is not too parochial. In Brighton, in response to the war on Afghanistan, a number of different (relatively small) protest groups were formed, reflecting different political tendencies. The most radical anti-war group (comprising anarchists, communists etc.) became a constipated direct-action group, in large part because of internal political differences. By contrast, in response to the threat of war on Iraq, a larger more inclusive group emerged despite such differences - a group which was also more lively and effective than the earlier groups. At first, there was the same split between the political factions. The pacifists and Trots organized meetings in the name of Sussex Action for Peace (SAfP), to which a small number of the direct-action types attended as delegates. But when, as in the case of the Afghan war, the separate direct action group itself petered out, the 'delegates' continued to attend SAfP, as we did. Within this umbrella group, factional identities were at first maintained: the Trots advocated marches; direct activists argued for small scale direct actions (and against marches etc. ); and the pacifist liberals argued that the cops had to be told about any actions the group planned. Halloween action served to resolve all the factional differences, and pleased everyone. It defined the identity of the group as whole. The expectation among many of the direct-action types was that 'the general public' would (a) not turn out in large numbers (b) not have the bottle for the planned street sit-down occupation, and that such actions would be left to the minority of activists who would therefore have to have just a token occupation for fear of getting nicked. In other words, militant mass action was not expected. However, a bold tone was set by a successful Critical Mass cycle protest which took place that afternoon. Critical Masses had been extinguished by the police in Brighton some years before. But a small group of cyclists setting off from Sussex University became a larger group which was then able to block off all of the southbound lanes of the trunk road into the town centre for more than an hour, despite the frantic and increasingly desperate efforts of the cops, who had not been consulted. Come the evening of the main gathering, dozens of cop vans lined the streets. Despite the cops' show of strength there was still not enough of them to deal adequately with the protest, which numbered at least 500 people. Being unable to physically to surround the crowd which had moved onto one of the main road junctions, blocking traffic in four directions, the panicky cops resorted to the use of batons and pepper spray. The failure of the cops to anticipate numbers and to successfully intimidate the crowd at this early stage only encouraged people to go further. Also, given that many people involved in the demo saw what they were doing as 'legitimate protest', suddenly being squirted with pepper spray and threatened with extendable batons served to reveal the partisan nature of the state the cops were defending. The rest of the evening then became a game of cat-and-mouse in which the crowd moved quickly and unpredictably to block various roads around the town, with the cops trying and mostly failing to keep up, and being further exposed as ineffective and buffoonish. One of the interesting features about what happened was that the majority of people involved were not politically experienced; both young and middle aged, many were people for whom the movement against the war was the first time they had been on a demonstration. They had relatively little sense therefore how seriously the cops took a mass obstruction of the highway - they either didn't know the law or simply had that liberal sense of moral righteousness - and were therefore unprepared for the cops' reaction. The sense of excitement and unpredictability - the feeling that anything might happen, that we had the initiative rather than the cops - marked the demo out as one of the best in Brighton for years. Many of us who were present were on a real high. Even at the end, when the cops finally managed to halt the progress of the crowd towards the shopping mall, and when they did a Section 60 around the rump, there was still a sense of triumph, which gave us some encouragement in the future of the movement, at least locally. While it must be acknowledged that what happened felt so good because expectations were so low, it was also qualitatively different than recent protests in terms of its autonomy, collective coherence and involvement of so many political neophytes. The events of Halloween had further consequences. When a more traditional march was held a month later, the cops policed it to saturation point, even though it had little potential to become a direct action event. The cops had spent a lot of money in their attempt to stamp out the 'Stop the City, Stop the War' actions at this early stage, which led to budget problems for them later on. Hence, they could not afford to police subsequent street demonstrations except in the form of 'traffic control', escorting rather than trying to suppress the protest. They tried to ban a demonstration in January, but were relatively helpless to prevent a 'Valentine's Day' protest in the main shopping centre. This protest was another moving 'Stop the City' action, which became the template for actions on the day war broke out (March 22nd) and in the weeks subsequently. The actions on the day the war broke out went on all day, led in the day-time by a school students march, and culminating with a partial attack on the town hall. Again there was at times a sense of power and unpredictability, as roads were blocked at will, with no agreed route. Versions of this protest became a weekly event. The attack on the town hall, in which in fact only a small minority of the crowd took part, and the occupation of various petrol stations in the subsequent protests might perhaps have appeared radical but in fact hardly went beyond the tokenism and symbolism of the liberals' marches. When we protested against the Gulf War in 1991, we didn't go to petrol stations to make some point about oil profits, we went to the army barracks and tried to stop them doing their daily business! The feeling that what happened was challenging and threatening lay not so much in the nature of the actions, which for the most part were nothing special, but rather in the number and variety of people brought into the movement and in the failure of the liberal peace movement to exercise control - as evidenced in the lack of the usual agreements with the cops on the routes and times of the demonstrations. One of the features that appeared to differentiate the recent anti-war protest and mark it out as a movement with some potential to go beyond the usual protest was the independent involvement of school-students. It was unprecedented and unpredicted. While there were some schoolkid elements on the 1991 Gulf War demos, and while children have always been involved in protests - both with adults and on their own - we have to go back as far as the '60s or '70s to find anything on remotely the same scale. Joining a march of schoolkids, you found yourself not on the usual plodding (and energy-sapping) march but almost running down the street, a pace which the kids kept up for hours. While adult activists supported the kids' demos, they were in large part unnecessary for the actions to take place. The kids' demos therefore had their own feel and flavour. They also showed little respect for adults at times. They didn't respect the cops, of course - they did not bother to tell them about their demonstrations in advance, in contravention of the Criminal Justice Act, and the cops were again left tail-ending the demonstrations. This lack of respect applied to the adult protesters as well as to the cops. For example, on the first day of the war, when the Brighton kids' protest march arrived at the location where they were due to meet up with other protesters, some of the adults wanted the kids to stay and wait until more numbers turned up. But the kids simply ignored this and carried on sweeping through town. They didn't seem to have time for the experience of adults because they were confident in the effectiveness of their own actions. There was therefore a refreshing lack of political socialization amongst the kids - they had not been brought up into and come to expect the usual boring way of doing demonstrations. So they brought some cheek and unpredictability to what they did. They also brought some radicality, as demonstrated by their willingness to get stuck-in on occasions: kids hurled pencils etc. at the cops for example at the Trafalgar Square protests, and stoned an army recruitment office in Oxford. On the one hand, many of the schoolchildren showed as much awareness of the issues as their adult counterparts (and were easily able to out-argue those arrogant adults who took them on yet who knew little of Middle-East history and politics); on the other hand, some of their actions went well beyond the conscious (liberal) rationales they gave for these actions. Some tried to disparage the kids' actions by suggesting that for many the protests were just an excuse to bunk off school; and some kids themselves defended the protests as a whole by saying that it was just a minority who used them to truant. These kinds of arguments falsely assume school to be a neutral institution. De facto the protests meant bunking off. It was also good that some kids also used the opportunity to extend their attack on the particular government policy of war to a practical critique of the general, everyday oppressive institution that is school. Likewise those school students who massed around Parliament Square on March 12th, ten days before war broke out, not only resisted the police but also underground train fares. As a mass - and their collectivity was impressive - they were ready to break the law. For good or bad, relatively few organizational links were made between the school-students protests and other anti-war groups. While the school students were typically the kids of adult anti-war protesters, the kids' protests were not simply a function of adult protests but were organized autonomously. But all the adult-dominated organizations wanted to get involved with the kids' protests: all - including us - were excited about what was happening and wanted to get and be a part of the action. A question that arises is why the school-students' movement developed how and when it did. For example, there was no equivalent kids' mobilization on the anti-capitalist demonstrations as on the anti-war demonstrations. Perhaps 'anti-capitalism' was too vague and diffuse a cause (international monetary organizations, multi-nationals, environmental destruction etc. ), and the threat of war (death and destruction of the Iraqi people, dead babies etc.) seemed more concrete to them. Perhaps the thing that made kids most aware of the issues around the war, and which made them feel confident to take collective action against it, was simply the wider anti-war movement itself. The anti-war movement went beyond the anti-capitalist movement in not only its size but also its inclusiveness. Kids could see their parents and others taking part in protest, and protest itself coming to be 'normalized', and therefore saw it as something that they could do. A theme of this article has been the potential of the movement. But what was the nature of this potential, and why wasn't it realized? For example, one might ask why, given their size, the national demonstrations were not more confrontational. It might be pointed out for example, that London crime and arrest rates were shockingly low on the day of the historic February demo, for it was generally a remarkably well-behaved affair. All the attempts to channel the movement in a 'radical' or particular political direction were dwarfed and lost in the sheer size of the protests, particularly the February 15th demonstration. On the historic February demo there were a number of initiatives you may not have noticed! There was for example a pacifist sit-down around Piccadilly, which had been planned and announced at the January national conference. A few people sat down and were moved by police, but their disruption was infinitesimal compared to the disruption the march was still making as it dispersed. fulfilment was a several thousand strong breakaway from the main march (which actually felt insignificant given the size of the demonstration) This petered out as the cops blocked one route after another. Other groups approached the embassy but all to the same (non-)effect. Considering that the embassy was probably the most guarded site in London and that people had not come prepared to deal with the rubber let alone real bullets that would have been used, this idea was not really serious. The London 'No War but the Class War' group that arose at the time of the Afghan war had spawned a more anti-theoretical direct action group, 'Disobedience', which organized a 'Hackney in the [Hyde] park' which was so small relative to the size of the demo it was difficult to find. Disobedience also produced an impressive print run of an agit-prop newspaper for the march, Disobedience Against War. Something unifying the somewhat contradictory articles was the futility of the traditional 'march from A to B', and the necessity of something more radical, in the form of direct action. However, it was apparent that the march itself was actually very effective in that it brought London to a halt to a far greater extent than a few thousand direct activists might have been able to do. Despite the absence of radical intentions, the demonstration blocked and dominated the streets, disrupted the traffic and brought the city to a halt. In effect, then, the direct-action idea of going beyond the march with a sit-down or breakaway to disrupt the city was superseded by the unintended but inevitable impact of the march. The fact that any impact of the movement was accidental seems to make the point that its excitement and potential lie not in any radicality it possessed - for there were no mass attacks on army recruiting offices, riots or suchlike - but rather in the sheer size of the movement. As in the Brighton experience, the importance of what happened was in terms of its inclusivity, for the movement brought in large numbers of people who were not normally politically active. As such, it was a genuinely social movement, in that it was not limited to the same old paper-sellers, 'revolutionaries', militants and concerned liberals who normally dominate such events numerically. This time, for a change, the politicos were outnumbered. On the other hand, it was not social in terms of being clearly informed by social/economic (i.e. class) interests. It was also not a social but a 'political' movement in that it overwhelmingly saw the issue as one of bad politics - a matter of changing a bad set of rulers and policies for a good set. In successfully helping to build a mass movement, the Stop the War Coalition didn't need to impose artificially the left-liberal pacifism its steering committee members themselves espoused. Rather, the predominance of this ideology in the movement reflected the lowest common denominator and the feeling of the majority. Thus, due to the relative lack of influence this time round of the CND-type liberal pacifists, while there was not the same dominance of an 'organized' ideology as we have seen in the past, there was so much 'endogenous' ideology that the pacifists' work was done for them. The dominant slogan on the protests before the war was 'Not in my name', summing up perfectly the individualized, democratic and essentially moral argument against the war. This 'humanist' ideology might be understood as a reflection of the current state of the limits of the class struggle: class analysis was submerged because of the continued relative weakness of the working class. In the dominant pacifist ideology, the opposition was seen as one between war and the human, or, perhaps more precisely, between war and society. In this middle class hegemony, the subject is the classless and individualized member of 'society'. In contrast to a class movement, the anti-war movement, rather than acting on the basis of material interests, expresses moral outrage. This is an expression of the 'separation between an "anti-war movement" dominated by ideals of peace and justice and the class movements that really end wars (the strikes, mutinies and revolutions that ended World War I and the insubordination, fragging and breakdown of the American military machine that ended the Vietnam War'. Yet we are faced with the anti-war movement as it exists, not as we might like it, just as we are faced with the class struggle as it exists not as we might like it to be. Indeed the movement dominated as it is by an organic middle class pacifism is one way that the class/value contradiction expresses itself at this time in the 'mode of being denied.' Just as the million who marched felt a need to respond to the barbarity of capitalist war so do we. And the way we did so was by involving ourselves in such a way as to attempt to push things further; in so doing one comes up against but can then best understand the limits of the movement. One approach is to identify some points at which the movement might have been more effective and might have developed beyond its limits. In the aftermath of the 1991 Gulf War, and printed an article which identified a number of points at which 'we could have done better' in our attempts to prevent the war. We argued then that the failure of radical tendencies to have more of an impact wasn't simply due to the dominance of the left-liberal leadership of the anti-war movement, but rather was more explicable in terms of a number of tactical errors. Such optimism was borne of the success of the anti-poll tax movement in which radical minorities had played a role. We had seen the nationwide occupation of town halls, the biggest London riot for 100 years, the abolition of poll tax and the demise of Thatcher. Also at that time the number of strikes began to rise again and hopes rose for a revival in class combativity following the nadir that had followed the defeat of the miners' strike in 1984-5. The situation with this war was very different and our hopes lay elsewhere. Perhaps the most obvious of the strategic points of potential development is that around the tension between the London marches and the actions around the airbase at Fairford, Gloucestershire. Fairford was the key European air base for most of the B52 aircraft which were the main bombers used in the war. But the combination of the localism of the Fairford organizers and the undermining actions of the Coalition served to keep the Fairford actions relatively small, while the London marches (which sometimes took place on the same day) were enormous (and passive). The point is that some people, as we did, thought that there was a possibility that Fairford could have been the central locus of a really effective anti-war movement, perhaps involving mass contingents from Europe. Before the war began, a number of protesters breached the airbase fence. Clearly, once the war had begun, the government - in the form of the army and police - would have gone to much greater lengths to prevent the possibility of mass occupation and sabotage of such a vital military base. They would have shot people if necessary. But even mass mobilizations of the army and cops would have raised the stakes considerably; mass conflict and antagonism would put the war effort under much greater threat than the millions on the streets in London. Some people attempted to build the protests at Fairford in this way. While in hindsight such a prospect seems premised on a whole series of contingent conditions, at the same time it seemed hardly any more outlandish than the international anti-capitalist protests that took place in Europe only a few years ago, at Genoa, Prague, Gothenburg and so on. Another form of action which might have made for an effective anti-war movement but which again failed to happen was in terms of workplace action against the war. In some countries, such as Italy, there was a much more significant involvement by workers than in Britain and some serious attempts to sabotage the war effort. But in the UK, the case of the two train-drivers in Scotland who refused to move supplies for the Ark Royal warship was a news story precisely because it was an exception. The movement against the war in Iraq in this country was essentially focused on extra-workplace activity - the best connections between workplace and anti-war movement organizations being the universities and town halls, as mentioned previously. Most proposed strikes and workouts failed. For most people, the connection between the workplace and the war wasn't an obvious one or as easy to achieve practically as going on a march; and so targeting work would have been difficult. And yet it would also have been more consequential than most of the marches and other actions. The best opportunity of a link between the war and the workplace was the fire-fighters' strike. In the strike before the war began, the government admitted that, with so many troops busy covering for the fire-fighters, it would be impossible for them to go to war. The potential of the dispute was therefore enormous, yet the practical links between the movement and the fire-fighters were paltry compared with the symbolic shows of mutual support. The leadership like other members of the 'awkward squad' of left wing union leaders, made anti-war noises at a political level, while promising not to undermine the war effort where it would have counted by striking during the war. The anti-war sentiments appeared to find little echo amongst the rank and file. Our experience of the strike was that it was union and union activist led, and when the government showed itself determined to defeat it, no autonomous initiative met the inevitable 'sell out'. The movement against the recent war on Iraq called into question the UK government's involvement in the war. A political crisis developed but it was just that - a crisis of politics. The Cabinet was on the edge of deciding against it; and we can also suggest that the strength of feeling as evidenced in the mass demonstrations may have delayed if not stopped the next war. But, while the movement shook sections of the ruling class, and arguably had the potential to provoke a political shift that would have prevented Britain's participation in the war, it did not do so, and the war went ahead. A precondition for war is a certain amount of unity among the population to give the war legitimacy and to make it practically possible; and it would seem that the national disunity represented by the anti-war movement served to delay the war by several months. But the usual effect of war is to build national unity; and, indeed, once the war had begun, there was a falling away in the anti-war movement and increased support for the war. The movement, which had done so well to that point to confront the sense of fatalism about war that governments depend on, was ultimately unable to convince many participants that 'we could do something'. And once this feeling of inevitability emerged, the context and hence the arguments changed to reflect this. While what happened was clearly not enough, it was also different and in some ways better than other recent mass mobilizations and anti-war movements. For us as people who take part in a lot of actions and demonstrations, the scale and energy gave us a sense of possibility. More than being simply something which we as people wishing to abolish capital do, many of our experiences in the anti-war movement were enjoyable and exciting. If we felt these things, it is possible that others did too. For all the liberal emotional outpouring, bourgeois support and elements of apparent spectacle, there were feelings of genuine power, hints of the susceptibility of the state to collective action, and a willingness to stay the course; although the movement fizzled out soon after the war began, it had kept up a high level of energy for months beforehand. In a country where we had not seen a really broad social movement since the poll tax the experience was gratifying. To the extent that these experiences stay in the collective memory, they can be brought to the next social movement. Images from some of the events in Brighton described in this article are archived here. An exception to this is Germany, where the strange phenomenon of German anti-Germanism led a part of the left to support the war because Israel supported it! See the National Security Strategy of the United States. The dilemma was concretized in the example of dithering and confusion around the samba-band led anti-capitalist bloc on one of the national demonstrations. It was unclear whether the bloc was meant to be a separate march or part of the main march, and what it was meant to achieve. While we reject the sociological use of the term 'middle class' as a category equivalent to that of working class, there is a moment of truth in its use as a short-hand for a particular relationship to capital and its concomitant subjectivity. See the discussion in our Review article 'From Operaismo to "Autonomist Marxism"', Aufheben 11 (2003), pp. 30-31. One alternative was called in the name of Schnews, but didn't appear to get far. We don't know many details of what happened in other places, except London, which by its nature is untypical. Section 60 is a piece of 'Public Order' legislation (in fact introduced to deal with 'football hooligans') allowing police to surround and thereby detain a crowd in a public place for as long as seen fit, and has been applied successfully (from the pigs' point of view) to such protests as Mayday 2002 in Oxford Street and Mayday 2001 in Trafalgar Square, when many people were angered but also too bored and tired by the end to react. Perhaps only just outdone by the mobilisation of the conservative Countryside Alliance who even went so far as to pick up all their own litter. While previous anti-war movements have had this middle-class and hence 'classless', humanist, pacifist character (e.g., CND and the threat of the bomb to 'humanity' etc. ), Théorie Communiste (in collaboration with Alcuni Fautori della Comunizzazione) suggest that it is particularly in its current restructuring that capitalism is experienced as a threat to 'society' (rather than to specific class interests, with which there is currently less identification than previously), and hence it is as 'society' that people react: 'The movement is pacifist. It is against the glaring necessity of the violence engrained in the restructuring of the capitalist relation and it is against this, now, in a way adequate to the acceleration of the restructuring that this war represents. [...] It is pacifist because unanimist, interclassist, consensual. The demonstrators know that the current war is the expression of a general violence, but no call to the "class war" will get them to overcome this radical democratism which urges them to oppose the war as if it was only the expression of the will of a few politicians whose illegality and arrogance must be denounced.' ('A Fair Amount of Killing', Supplement to Théorie Communiste 18, p. 6). '"Anti-Capitalism" as Ideology ...and as Movement? Preface: From Anti-'Globalization' to Opposing the War', Aufheben 10 (2000), p. 1. See 'Lessons from the Struggle against the Gulf War', Aufheben 1 (Summer 1992).